Anorexia nervosa is a complex psychological disorder that literally involves self-starvation. People who suffer from this illness eat next to nothing, refuse to maintain a healthy body weight for their corresponding height, and frequently claim to "feel fat" even though they are obviously emaciated. Because anorexics are severely malnourished, they often experience symptoms of starvation: brittle nails and hair; dry skin; extreme sensitivity to the cold; anemia (low iron); lanugo (fine hair growth on body surface); loss of bone; swollen joints; and dangerously low blood pressure, heart rates, and potassium levels. If not caught and treated in time, victims of anorexia nervosa can literally "diet themselves to death." The prevalence of anorexia nervosa is estimated at 0.1-0.6 percent of the general population—90 percent of the sufferers are women and roughly 6 percent are boys and young men. Although any personality can fall victim to this life-threatening illness, most anorexics tend to be perfectionists who keep their feelings bottled up inside, straight-A students, good athletes, and people who always do the right thing. For anorexics, restricting and controlling food becomes a way to cope with just about anything. 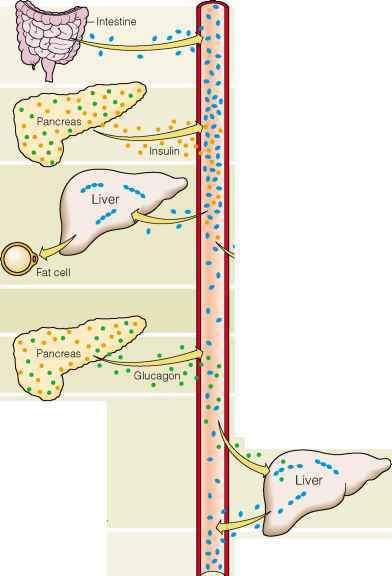 Abnormal loss of 15 percent (or more) of normal body weight with no medical reason for the loss. It can also be a failure to gain an expected amount of weight during a period of growth for younger children and adolescents. An intense fear of becoming fat or gaining weight, along with strict dieting and severe caloric restriction—despite a rail-thin appearance. In females, absence of at least three consecutive menstrual cycles otherwise expected to be normal. Constant preoccupation with food. Anorexics will often cook and prepare food for others but refuse to eat anything themselves. Distorted body image. For example, claiming to "have fat hips" even though scales and mirrors show that they are severely emaciated. Strange eating rituals such as cutting food into tiny pieces, taking an unusually long time to eat a meal, and constantly preferring to eat alone. Obsessively overexercising despite fatigue and weakness. Becoming socially withdrawn, isolated, and depressed. Anorexia nervosa means "appetite loss of nervous origins." 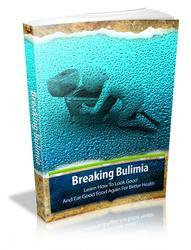 Bulimia means "ox-like hunger." At 13 years of age and 112 pounds, I wasn't very involved in the world around me. Sure, I saw the fried chicken, mashed potatoes, cakes, and cookies, but boys, clothing, and beaches eluded me. Don't get me wrong, I wasn't miserable all the time; I just wasn't particularly happy. In fact, most of the time I was nothing; I was just FAT! Like most perfectionists, I seemed to do everything to extremes. Initially, I ate to the fullest, and later, when my doctor told me I needed to lose weight, I dieted to the skinniest. Three hundred sixty-five days later and 52 pounds lighter, the new Jane emerged. I had exercised and dieted my way to health. Burgers and taxis were out, low-fat foods and biking were in. Not surprisingly, my doctor was ecstatic with my success, and my family was beaming with pride. My friends, on the other hand, were filled with that strange combination of jealousy and admiration, and finally for the first time in my life, guys noticed me. They whistled when I walked down the street and approached me at school. "Wow," I thought. "If I can get this much attention at 120 pounds, imagine how great life could be at 110." At 100 pounds, I thought I had found bliss: I could count my ribs, pull down my pants without unbuttoning them, and most importantly, I could go an entire day on just a small fat-free frozen yogurt. Months flew by, and my weight continued to plummet. Exhausted, freezing, and wearing size-0 clothing, I had propelled myself into a lonely abyss. Summer nights felt like the dead of winter, and the urge to sleep was unstoppable. I knew I was sick—everyone knew I was sick—and I was ultimately diagnosed with amrexia nervosa. Although I rejected the notion of having a disease, I struggled both mentally and physically with solid foods and decreasing my amount of exercise. Gradually over the course of a year, I regained both my body and my life. I admit, low-fat foods and exercising are still entrenched in my life, but this time in a healthy manner, not as a destructive disaster. I must push myself to eat a risky meal (a "scary' meal with fat) every other day and allow myself to indulge in a dessert treat twice a week. Although I still obsess about my weight, it's no longer about losing; instead, it's about maintaining. I have been at my current healthy, thin weight of 112 pounds for the last year, and I guess you can say I have finally found an ideal way to exercise my "control." I "control" what I eat and how much I exercise, not in a freezing abyss, but in a hot, sweaty gym.